AustCham’s Manufacturing committee organised a factory tour of Senior Aerospace on Thursday 16th August, 2018, where CEO, Simon Shale, shared best practices in manufacturing process quality. The tour also provided an opportunity for manufacturing professionals to share views and experiences on manufacturing issues on the Eastern Seaboard. Thanks to the team from Senior Aerospace for devoting their valuable time to share experiences with us. The Australian-Thai Chamber of Commerce (AustCham), in collaboration with Partner Chambers, invited members and guests to join our Members Briefing on “Central’s Retail Developments and Opportunities in Phuket”, featuring a presentation from keynote speaker Khun Pakorn Partanapat, Chief Operating Officer of Central Pattana Public Company Limited, on Wednesday 15th August, 2018, at the Novotel Phuket Phokeethra. Khun Pakorn presented on Central Phuket’s new luxurious wing “Floresta” due to open 0n 10th September 2018, and what the expansion can mean for other businesses on the island. AustCham President Brenton Mauriello attended the signing of the blessing book on the auspicious occasion of Her Majesty Queen Sirikit of the King Rama IX’s Birthday Anniversary. AustCham Vice President, Charles Wrightman attended the signing of the blessing book on the auspicious occasion of His Majesty King Rama X.
AustCham Past President, Leigh Scott-Kemmis attended recording session of the blessing on the auspicious occasion of Her Majesty Queen Sirikit of the King Rama IX’s Birthday Anniversary. AustCham joined AMCHAM (hosts), BCCT and GTCC to welcome key leaders in this initiative who will provide background on Thailand’s Regulatory Guillotine: “Cutting Red Tape, Licenses, and Permits for Economic Growth and its objectives, process, and potential outcomes.” In 2017, the Royal Thai Government initiated a deregulation program to cut and amend certain regulations in order to improve the “ease of doing business” ranking for Thailand. Phase 2 of the regulatory guillotine program will start soon and there is an opportunity for American Chamber members in the private sector to participate. Phase 2 will focus on reviewing national license and permit requirements with the objective to eliminate redundant licenses and streamline burdensome and complex procedures in order to promote efficient business activity and economic development. The private sector is now being asked to suggest priority issues to the Regulatory Guillotine Unit on licenses or permits that should be reviewed. 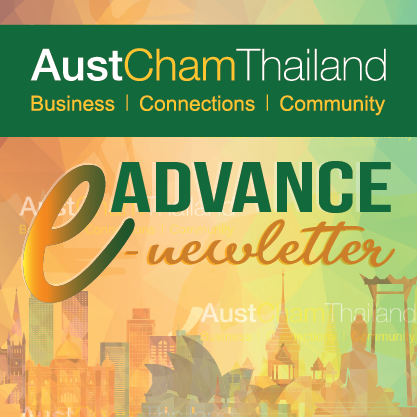 The Australian-Thai Chamber of Commerce, together with all Thailand Chambers, invited members to attend a Members Briefing on “Developing the Thai Workforce”, featuring presentations from leading Australian companies Bluescope and ANCA. One of the most important issues across all industries in Thailand is the lack of skilled workers, and the need to improve skill levels either in the early stages or even before employees enter the workforce. To meet the challenge head on, two Australian companies have initiated programs that are aimed at developing their workforce through agreements with Australian & Thai education institutes. In this session, they shared their stories and experiences with a view to helping other companies accomplish the same goals. Austrade was also on hand to explain how companies can connect with Australian Education Institutes. The Minister of Education, Dr. Teerakiat Jareonsettasin, set up the committee to advise on the development of Thailand’s vocational national curriculum to be more international and to suit the needs of the commercial and industrial sectors. AustCham also met with our colleagues at the Australian Embassy from Austrade and Department of Education to further discuss how we can assist to develop vocational education standards in Thailand.